Walking down the carpeted stairs into a small dimly lit basement, you might not realize the thriving and warm community that meets here. Exercise machines have been pushed to the sides, Sportsnet plays quietly on a TV in the corner and trophies stack along bookshelves, tables, overflowing to the floor. Joe Gould opens his home to a dozen men every Thursday evening. Among this group of grown men enters Patrina and Nicky Brooks, 17 and 14-year-old sisters. Patrina laces her pink running shoes and puts her long hair into a ponytail, while laughing with her family. The Brooks sisters walk up to the red table, roll up their sleeves, look at each other as they put their elbows on the table, hands hooked together. Gould instructs them in their positioning and then yells “1, 2, 3, G-O!” The girls’ hair flips to opposite sides and their faces scrunch, as if helping them to exert more bicep muscle to pin the other down. Patrina and Nicky Brooks face off against each other at the Belleville arm wrestling club. Joe Gould, founder of the club, sets up the sisters for their match. 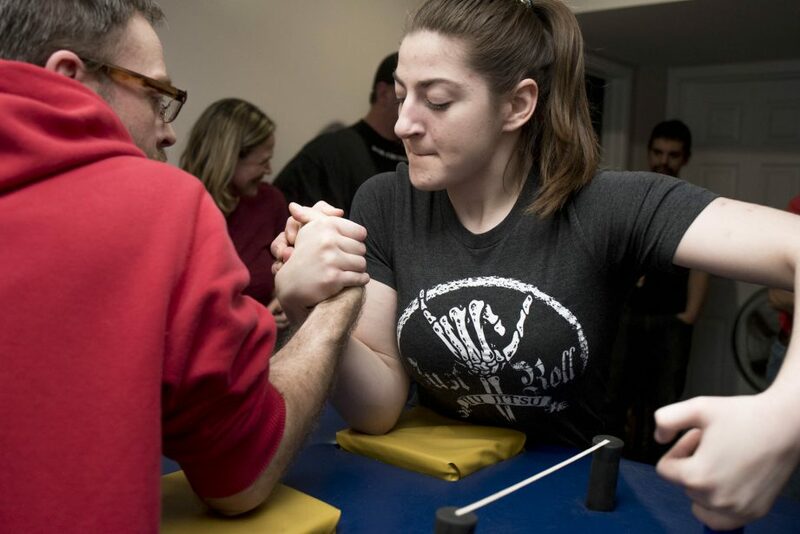 The Brooks sisters started arm wrestling 10 years ago; Nicky was just three years old and Patrina was six, when their father, Tony Brooks, discovered the club. Their grandfather, Dave Brooks, also joined the family tradition soon after. The Brooks sisters both hold National titles in the arm wrestling youth divisions. Photo by Shelby Lisk. The sisters have been arm wrestling for 10 years and both have provincial and national titles under their belts. Nicky won her first tournament in 2008 when she was only three-years-old and Patrina has started competing in the women’s division against those at least two years older than her. In 2017, the girls attended the Arm Wrestling National competition in Halifax, N.S. over the Canada Day weekend. On the Saturday of the competition, both girls competed in the youth division, winning in their weight classes, on both their right and left arm. On the second day of competition, Patrina decided that she wanted to try for a women’s title for all of Canada. She won with her left arm and got second place with her right. Patrina qualified and had the chance to compete at the World Arm Wrestling competition in Turkey this fall. The caliber of skill that she saw there has motivated her to continue training for another chance at a world title. “It’s actually amazing knowing that you can be this young and accomplish goals like that,” says Nicky. 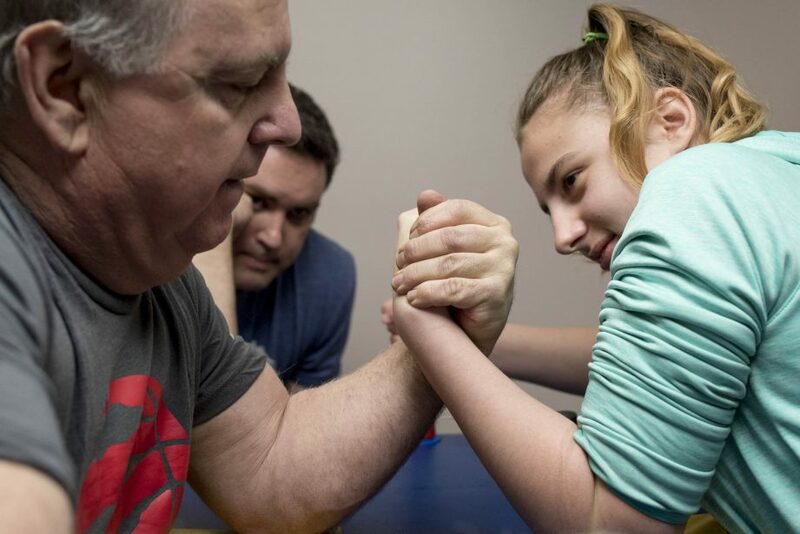 They started coming to the Belleville Arm Wrestling Club after their dad, Tony Brooks, discovered the club. They later recruited their grandfather to come with them as well. It’s now become a family tradition. “I feel like it makes a stronger connection, brings us closer together, creates that stronger bond,” says Nicky. Her sister agrees: “It kind of brings you together. You can train together to get better, go to tournaments, beat some people, celebrate after,” Patrina adds. However, looking around this room, these two teenage girls stick out from the grown men. Patrina says there are women who arm wrestle in bigger city centres like Toronto and Ottawa but they don’t encounter other women doing it in the Belleville area. “I think a lot of people would be intimidated when they hear about arm wrestling and think. ‘Oh, that’s a guy sport.’ It’s really not. It’s definitely for boys and girls. I think a lot of women especially would be intimidated but once they come out, they would meet the people they would feel the atmosphere. It’s like you’re joining a family, it’s your second family,” says Patrina. Both girls emphasize that they feel right at home training with the guys and it allows them to push themselves in their strength. The sport is aggressive though. In what other sport are you face to face, nose to nose with your opponent? Gould describes it as the closest you can get to a fist fight when you’re going to shake hands after. Nicky and Patrina also love challenging people’s perceptions by being young, feminine women who are also tough as nails. “A lot of people don’t know that arm wrestling is even a sport and the fact that there’s provincials, nationals, worlds. They’re really surprised, especially when they hear that small girls are going to win big titles like that and even beating guys. A lot of the time I’ll get challenged at school and I’ll be beating the guys,” says Nicky. Patrina feels that as the sport gains in popularity, there will be more women joining but right now a lot of people don’t know about it. For now, the girls will enjoy their training and competing alongside the guys. “When you’re in the youth division and you compete against the boys, I’ve made them cry,” says Nicky. “Not a lot of boys like to admit that they’ve been beaten by little girls… but it happens. That’s why you can’t underestimate anybody,” Patrina adds laughing. 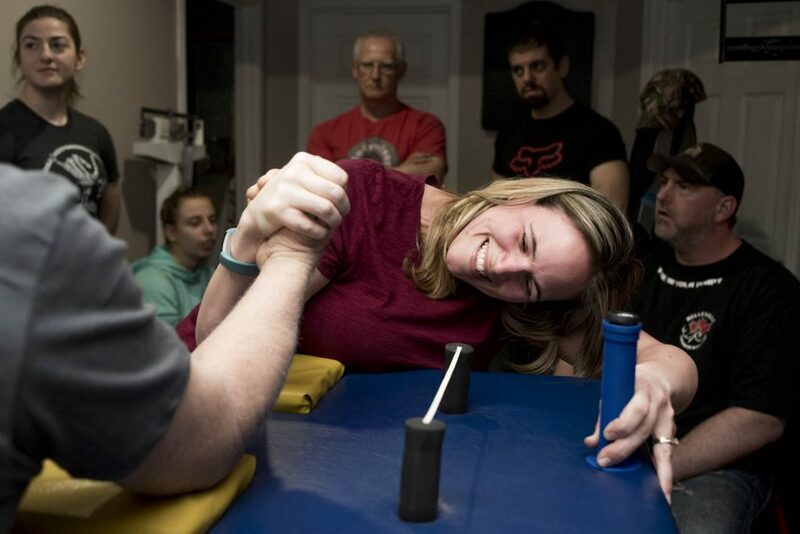 The Belleville Arm Wrestling Club has been around since 1995, when Gould started it with two other members. Gould learned all he could about arm wrestling from his older brother, Mikel, who trained with the Port Perry club and holds two world championship titles, won in Japan and Sweden. Mikel also holds the record for the most heavyweight Canadian Championships. Gould’s training meant that when he started the Belleville club, he was already knowledgeable on the skills and techniques. Gould also has quite the impressive record behind him, having won six national titles and eight provincial titles. He clearly has an immense passion for the sport, not only founding the Belleville club but also hosting 10 tournaments a year through the Arm Melters Arm Wrestling League. The club fluctuates in size but Gould says there are about 20 members right now which includes men, women, seniors, children and people of all different skill levels who are training together to improve their techniques and strength. “It’s a blue-collar kind of people but really people from all walks of life do it. There’s stereotypes that it’s truckers or it’s bikers or whatever. But it can be bikers or truckers or doctors or lawyers and everybody in between. You meet people from all walks of life. But one thing is to me it’s kind of an exercise in assertiveness. It’s a physical assertiveness but there’s also a different level of assertiveness,” says Gould. For more information on the league, you can find the Arm Melter arm wrestling league’s Facebook page with information on upcoming events, past results, videos and training tips.